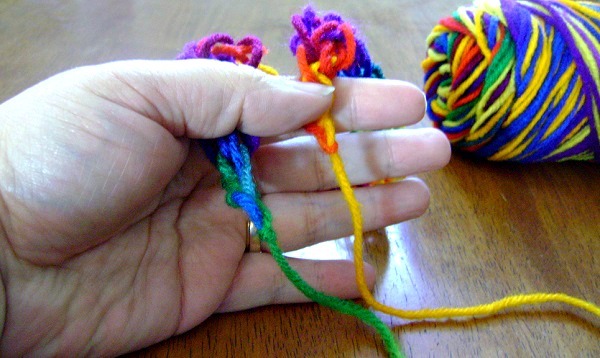 Finger knitting is a fun activity for kids. It's easy to do and doesn't require very much in the way of supplies - just yarn, your hands, and a pair of scissors! There are very many different methods (and we'll be exploring some in future posts) but, the method for this finger knitting headband is a simple wrap technique. Last week I shared simple instructions for finger knitting for beginners. You are going to use those basic instructions to make a headband. You'll want to use yarn on the thinner side for this project - chunky yarn doesn't make great headbands. Follow those instructions to make the knitting as long as you need to wrap around your head (slightly tight - as the yarn will stretch a bit). When it's as long as you need it to be you'll want to knot off both ends. After each end is knotted off, tie them together then snip off the extra yarn. That's all there is to it! You could always add a cute button or flower to the side. It's a super-simple headband, but a nice and easy starter project for kids who are just learning to finger knit. Once they get the hang of weaving the yarn between their fingers and find a nice rhythm, they'll finish this project in less than an hour.